If we are all becoming global citizens, what then are our civic responsibilities? Colleges and universities across the United States have responded to this question by making the development of global citizens part of their core mission. A key strategy for realizing this goal is study abroad. After all, there may be no better way for students to acquire the knowledge, skills, and attitudes required to become effective change-agents in international contexts. What do we mean by global citizenship and global competence? What are the philosophical, pedagogical and practical challenges facing institutions as they endeavor to create global citizens? How is study abroad and global citizenship compatible with the role of the academy? What are the institutional challenges to study abroad, including those related to ethics, infrastructure, finances, accessibility, and quality control? Which study abroad programs can be called successful? 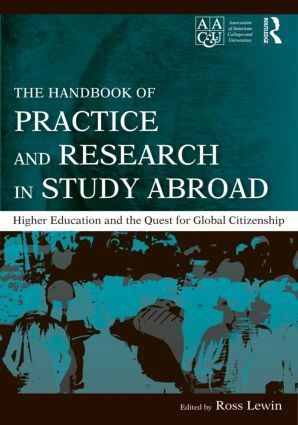 The Handbook of Practice and Research in Study Abroad is an indispensable reference volume for scholars, higher education faculty, study abroad professionals, policy makers, and the academic libraries that serve these audiences. It is also appropriate for a wide range of courses in Higher Education Master’s and Ph.D. Programs.